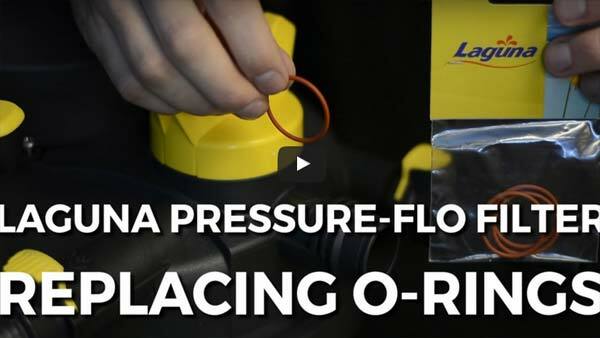 How To: Replace O-Rings in a Laguna Pressure Flo Filter The Laguna Pressure-Flo is a sealed pressurized filter. The installed O-rings provide water tight seals in 4 locations. We can start with the Fittings. These are located inside the click-fit connection port and are an orange/red color so they're hard to miss. Next, we can move onto the UVC head. This O-Ring is located on the underside here. While we have the UVC out and upside down, we can replace the two on the quartz sleeve. These are located at the base of the sleeve behind under retaining flange. To access, pull the sleeve straight up after the flange is removed. For additional information on what we discussed today or information on replacing another component on the Pressure-Flo Filter, please don't hesitate to contact me. UV bulbs generally have a lifespan around 12 months of continuous use and should be replaced accordingly.